This morning, the government including MLAs Meegan Fitzharris and Jayson Hinder, TAMS, ACTION and Capital Metro held a drop in session at Gungahlin Market place. They had on hand updates and information about current and planned roads projects in Gungahlin. 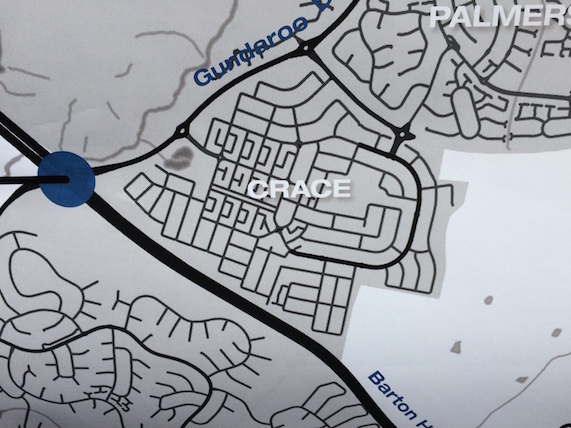 While all roadworks in Gungahlin are of interest, there are two projects in particular that impact all Crace residents – the Barton Highway roundabout signalisation and the Nurdurr Drive extension. The Barton Highway roundabout is coming along well, and is on track to be finished and operational in August. The next major milestone will be building the pedestrian bridge on the Gold Creek side of Barton Highway to allow using the current pedestrian path as a third lane for cars. In the meantime, the slip lane going from Gundaroo Drive on to the Barton Highway towards Civic could be open in the next 6-8 weeks! TAMS don’t expect significant improvements until the traffic lights are built and turned on, though I’m hopeful this slip lane helps. The environmental impact assessment on the proposed Nurdurr Drive extension site is almost finished and should be published in the next 4 weeks. It appears that the assessment is positive, and I understand should clear the way to proceed with this extension. The Nurdurr Drive extension is not currently budgeted at all, though with the assessment finalised, it may happen sooner than expected. Finally, I’ve been given some contact points to progress various suggestions made in our recent roads and parks survey. I’ll keep you updated as I know more.